Just like many readers, I work with a lot of gymnasts both on our team and at Champion who struggle with limited overhead flexibility. It can be frustrating for the gymnast due to a lack of progress in skills, and I often see it as a factor that increases the risk of lower back pain, wrist pain, and elbow pain in gymnasts. I have written quite a bit about this topic before, but I am always trying to learn about ideas to improve upon the methods I use. After a few years of reading research and trying a ton of things out, I have finally started to narrow in on what drills seem to be really effective in increasing overhead flexibility. 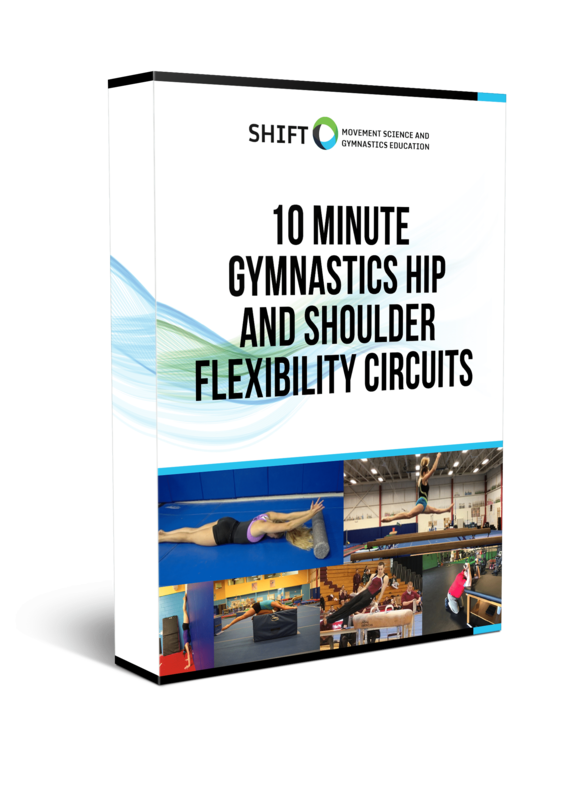 I am constantly asked drills I use with gymnasts who have limited shoulder flexibility, so to help readers out I wanted to give readers an example directly from the gym that they can start using. 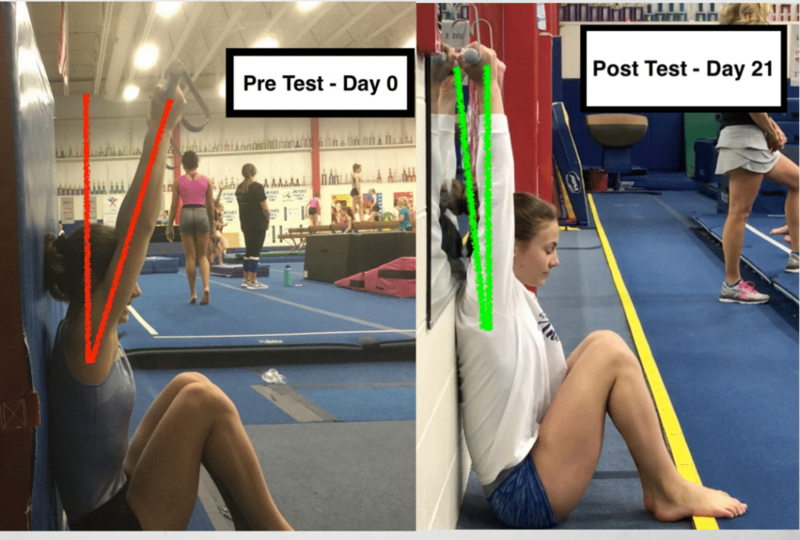 One of our gymnasts recently went through a growth spurt, and over the course of the competitive year started to lose her overhead shoulder flexibility. It was causing problems on her beam series (falling and no consistency, lack of shoulder angle causing missing hands/fear of skill) as well as tumbling and vaulting (limited arm swing to generate power). The first day I screened her this was her available range of motion when testing a seated wall test in over grip, undergrip, and hand of hand grip for beam. Here is the circuit she did every day (along with many other gymnasts who need this on our team). It consisted of 1 minutes of light soft tissue work using a lacrosse ball/foam roller to the latisimus dorsi and teres major on both sides, 1-2 minutes of an undergrip lat PVC stretch, 2 sets of 10 elevated arm circles with palms up, 5 reps of 5 second eccentric chin up lowers, and finally tucked all handstand drills. It’s important to realize there were some very important concepts behind why this circuit worked so well. The movement assessment was performed first, so we knew exactly what to focus on (lat, teres major, upper back strength, technique) and what not to spend time on (pecs, thoracic spine mobility, wrist flexibility). The flexibility program was made from this, not randomly throwing exercises and hoping they worked. This program could look VERY different for another athlete who maybe had other issues. We also had her do the wall screen every few days to make sure the exercises were working. The key is to understand the principles and design the program based on the athlete as an individual. A consistency over intensity mindset was used. She was great and took accountability to do her circuit every day on her own after we had a long discussion about why it was so important to work on now that season was over. It took three full weeks before we saw some notable gains in her flexibility. We modified her strength program to reduce the amount of lat and teres work she was doing with overhead pulling (high volume pull-ups, rope climbs, leg lifts) and replaced them with upper back horizontal rowing (renegade rows, feet elevated rows) so that we weren’t feeding the fire. 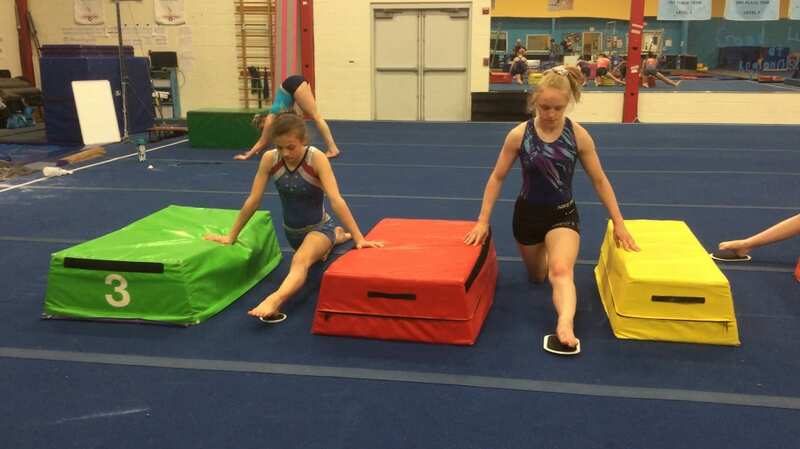 This imbalance is incredibly common in many gymnastics programs. Certainly, overhead pulling is critical in gymnastics, but not so much that it limits the needed shoulder range of motion. A circuit approach was taken over only an aggressive stretching protocol. The goal of this was to do a little bit of each approach the current body of flexibility research says is effective for increasing range of motion. We used light self-soft tissue work (research here), targeted stretching that biases muscles, not ligaments or joint capsules (research here and here), eccentric strengthening (research here and here), and transferring the motion to gymnastics specific skills. So, I hope that helps readers with both some practical drills to use in the gym, but also some more concepts on what goes into designing individual flexibility programs like this. Hope it helps! Looks great and would love to see more. Thank you so much for sharing. I would like a paperback copy or an e copy of your book. Would you be open to selling it through the usual channels? I am happy to pay for your amazing knowledge. An Essential Hip Strength Exercise All Gymnasts Need – Weighted Single... Is It Possible to Produce High Level Gymnasts Without Sacrificing Health?